"ÖBB" and "OEBB" redirect here. For other uses, see OBB. The Austrian Federal Railways has had two discrete periods of existence. It was first formed in 1923, using the Bundesbahn Österreich name, as a successor to the Imperial Royal Austrian State Railways (kkStB), but was incorporated into the Deutsche Reichsbahn during the 1938–1945 Anschluss. It was reformed in 1947, using the slightly different Österreichische Bundesbahnen name, and remains in existence in this form. Eurobarometer survey conducted in 2018 showed that satisfaction levels of Austrian rail passengers are among the highest in the European Union when it comes to punctuality, reliability and frequency of trains. Unlike other major railway companies in Europe that offer more flexible cancellation policies, ÖBB only offers two types of tickets: non-exchangeable/non-refundable tickets versus full price tickets. 1882 – Gradual nationalisation of the railway network of the Austro-Hungarian Empire into the Imperial Royal Austrian State Railways (Kaiserlich-königliche österreichische Staatsbahnen, kkStB). By the outbreak of the World War I, the only major railway in Austria to remain in private hands was the Austrian Southern Railway (Südbahn). 1918 – After the break-up of the Austro-Hungarian Empire following the World War I, the Austrian rump of kkStB remained in state control under the name Deutschösterreichische Staatsbahnen (DÖStB), which was renamed the Österreichische Staatsbahnen (ÖStB) in 1919. 1923 – Foundation of the independent, commercial enterprise, the Bundesbahn Österreich (which used the abbreviation BBÖ, because ÖBB was already taken by the Swiss Oensingen-Balsthal-Bahn). This company took over the assets of the ÖStB and the Südbahn, together with other minor railways. 1938 – The Anschluss of Austria into the German Empire. The BBÖ was taken over by the Deutsche Reichsbahn. 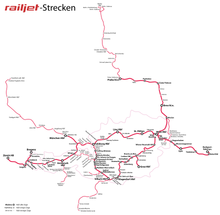 During World War II about 41% of the Austrian railway network was destroyed. 1947 – The company was reformed using the slightly different name of Österreichische Bundesbahnen and the abbreviation ÖBB (by that time the Swiss private railway used the abbreviation SP for its goods wagons in international traffic, so its abbreviation ÖBB could now be appropriated) as a state-owned company. Their infrastructure was rebuilt and electrification was accelerated. 1969 – A new federal railway law was enacted. 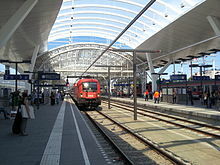 The ÖBB became a non-independent, economic entity, that was run as a branch of the government's industrial programme and remained entirely within the Federal budget. 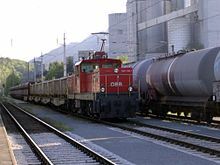 1992 – The ÖBB were broken out of the federal budget and turned into company with its own legal status (a cross between a GmbH and an AG in Austrian commercial terms). The company is 100% owned by the Republic of Austria. This change had two primary aims: 1. It had to conform to EU rules on the admission of Austria into the European Union. 2. The financial demand on the public purse was to be reduced as a result of improvements in efficiency and the pressure of competition. 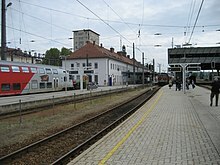 2004 – The ÖBB were reorganised into ÖBB Holding AG and a number of operating subsidiaries. The holding company was to oversee the operations of the companies assigned to it, coordinate a coherent strategic approach and allocate tasks for the whole enterprise. 1 January 2005 – The subsidiaries of ÖBB-Holding AG became autonomous and independent operationally. In 2012, ÖBB celebrated the 175th anniversary of the Nordbahn, the earliest predecessor company marking the start of rail transport in Austria. ÖBB CEO Christian Kern inaugurated an exhibition on the company's collaboration with the Third Reich, named "The Suppressed Years – Railway and National Socialism in Austria 1938–1945". He referred to that period as "the darkest chapter of our company history," adding that the company must accept this period as part of its legacy. The exhibition later went on tour and was presented at the European Parliament's parliamentary building in Brussels. The Austrian rail system is largely electrified. Electrification of the system began in 1912 but did not reach an advanced state until the 1950s. The last steam locomotive in regular service on the standard gauge network was retired in 1978. Flying wheel-styled symbol with one "B" on each side of the "Ö". Stylized "O" symbol with extending arrows in use from 1974 to 2005. Present logo in use since 2005, with the power symbol-styled Ö. 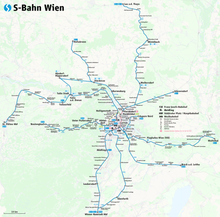 By a law of August 2009, the organisational structure dating from 2005 was further modified; the railways are under the control of ÖBB-Holding AG, a holding company wholly owned by the Austrian state, under the Ministry of Transport. The infrastructure of the state-owned Austrian network is managed by ÖBB-Infrastruktur AG, which was formed from former infrastructure-related units including Brenner Eisenbahn GmbH. It now manages 9,740 km of track, 788 signal boxes, 247 tunnels, 6,207 bridges and eight hydro-electric power (hep) stations for the 16.7 Hz electrification system, and two hep stations for 50 Hz power generation. At the end of 2009 it employed 17,612 staff. ÖBB's bus services travel 52,500,000 km (32,621,988 mi) per year. All neighbouring railways have the same gauge. ^ a b "GESCHÄFTSBERICHT 2017 ÖBB-HOLDING AG" (PDF). ÖBB. Retrieved July 11, 2018. ^ "„Verdrängte Jahre – Bahn und Nationalsozialismus in Österreich 1938–1945"" (in German). erinnern.at. Retrieved 21 May 2016. ^ a b Richter, Karl Arne, ed. (2010). Europäische Bahnen '11. Hamburg: Eurailpress. ISBN 978-3-7771-0413-3. ^ "Organigramm". ÖBB. Retrieved January 9, 2018. ^ "Daten & Fakten". ÖBB. Winchester, Clarence, ed. (1936), "Austria's rail transport", Railway Wonders of the World, pp. 971–977 , illustrated account of Austrian railways in the 1930s.